This article discusses major plot points from Marvel’s Iron Fist season two. I’m used to superhero storytelling feinting at “girl power” iconography before quickly returning things to the status quo. So when the eighth episode of Iron Fist’s second season ended with Danny Rand (Finn Jones) suggesting that Colleen Wing (Jessica Henwick) be the one to control the power of the Iron Fist, I cheered but remained skeptical. I thought at best we’d get a quick moment where Colleen takes the Iron Fist, punches someone, and then gives it back to Danny. But over the course of the next two episodes it became clear that Iron Fist wasn’t just paying lip service to the idea that rational, responsible Colleen Wing is a far better choice to wield the power of the Iron Fist than irrational, impulsive Danny Rand. By the end of the season, the show actually goes all-in on the idea of radically shifting its status quo in a way none of these Marvel Netflix shows has really done before. That speaks to the impressive way Iron Fist’s second season was willing to restructure itself after its lackluster debut. In its sophomore outing, the show is unapologetic about throwing out what didn’t work, keeping what did, and charting a whole new path in the process. With a shorter episode order (10 episodes instead of the usual 13), Iron Fist’s second season very much feels like a transitional one. It tells a complete arc to a certain extent, but it’s also focused on leaving plenty of threads open for what could be an even more exciting third season. At its worst, season two gets bogged down by the weight of addressing the show’s initial flaws and steering them in a new direction. But at its best, it’s an exhilarating reimagining of the series. With season one showrunner Scott Buck busy with Inhumans (the most universally panned MCU property), M. Raven Metzner was brought on to helm the second season. Metzner may not have had the most impressive résumé himself—he co-wrote the 2005 Jennifer Garner-led film Elektra and has written for TV shows like Sleepy Hollow and Heroes Reborn—but he turned out to be a great fit for Iron Fist. The most obvious place where Iron Fist’s second season improves over the first is with its action. At a bare minimum, it seems reasonable to expect a kung fu superhero series to deliver some engaging action sequences, but the first season was a complete mess on that front. Finn Jones couldn’t even perform simple tai chi moves with conviction, let alone handle the more complex fight choreography that was reportedly sometimes thrown at him 15 minutes before shooting. Only one or two fight scenes from the first season rose above the level of barely passable, but the second season is a whole new story. Black Panther fight coordinator Clayton Barber was brought on to revamp the look of the show’s action, while Jones was given way more time to train for the fights. An opening action sequence in which Danny takes out a truck of gang members sets the stage for a season that doubles if not triples its number of action sequences, while also giving each character a unique fighting style and ensuring each fight feels like a distinct battle rather than a boring blur. A showdown at a tattoo parlor takes great advantage of longer takes, while a restaurant-set fight makes creative use of props. The season also overhauled its storytelling structure, addressing pretty much all of the concerns I had while reviewing the first season. We finally get flashbacks to K’un-Lun that provide more context for what it means to be the Iron Fist, how Danny came to be chosen for the honor, and what his relationship with Davos was like growing up. Jones is still one of the weaker aspects of the series but, mercifully, he’s no longer asked to play the one emotion he was absolutely terrible at playing in the first season: angry petulance. Iron Fist’s second season acknowledges that Danny is often a hotheaded jerk (something the first season did in its best moments as well), but it does so without asking Jones to just angrily shout his lines at random points. Much of the season is about Danny actively coming to terms with just how flawed and limited his worldview is, which is a satisfying response to his messy season-one arc. Elsewhere, one of season two’s strongest choices is to elevate Colleen to a true co-lead. She has her own motivations and carries her storylines independently of Danny—many of them alongside Luke Cage expat Misty Knight (Simone Missick). Season two invests in Colleen and Misty’s friendship as a major component of the series, not just as something to fill time or shallowly pay lip service to their Daughters Of The Dragon partnership from the comics. The way Misty is so naturally and meaningfully woven into the series takes advantage of the Defenders’ shared universe concept better than any of these Marvel Netflix shows have since Karen Page joined The Punisher. It helps that Henwick and Missick are such talented, likable performers with a really believable friendship chemistry. The other area in which Iron Fist’s second season blows the first out of the water is how it uses its antagonists. The first season was a mess in that regard, stretching out Harold Meachum’s (David Wenham) story for far too long while introducing antagonists like Bakuto (Ramón Rodriguez) and Davos (Sacha Dhawan) way too late. Season two is helped by the fact that the Defenders miniseries finally wiped out The Hand—an expansive mythical enemy that never worked as an antagonist for these street-level Marvel Netflix shows. The status quo at the beginning of the season is that the destruction of The Hand has left a power vacuum in Chinatown, which the local Triad gangs are more than happy to fill. The gang struggles run throughout the season, providing fodder for some of the early fight scenes and giving the show a chance to comment on bigger ideas about violence and diplomacy. The series smartly gives us a few central characters to ground that ongoing thread—including lost street kid BB (Giullian Yao Gioiello) and emerging Hatchet leader Mrs. Yang (Christine Toy Johnson, great in a small role). And although the story of BB’s teen gang really leans into the cheese, it fits with Iron Fist’s overall interest in lost kids who are corrupted by violence. One of the best parts of Iron Fist’s first season (and, yes, there was stuff to like there, particularly in the second half) was its exploration of Danny, Davos, and Colleen as three lost souls struggling to come to terms with childhoods spent in manipulative, violent environments. In season two, Danny and Colleen are actively trying to move away from their past and start a new future together, but Davos is still dead-set on continuing K’un-Lun’s legacy. That makes him the villain of the season, but like Wilson Fisk or Erik Killmonger, he’s a Marvel villain whose underlying motivations are understandable and sympathetic—even if his methods are egregious. Dhawan builds on his great work from the first season, subtly portraying the mixture of moral righteousness, disorientation, and anger that Jones could never quite get across. The actor’s particularly heartbreaking in a flashback in the season’s fifth episode in which Davos makes a painful failed attempt to connect to his demanding mother. He’s also absolutely hilarious whenever Davos delivers a deadpan one-liner about the corruption of New York City. Metzner further complicates the narrative of season two by throwing in a wildcard in Alice Eve’s Mary Walker (a.k.a. Typhoid Mary from the comics, though she’s never called that in the show). Like Split before it, there’s something inherently icky about exploring a stigmatized and controversial real-world psychological disorder within a heightened superhero setting. But Iron Fist at least mostly takes Mary’s dissociative identity disorder as a fact of her life, rather than something that is, in and of itself, villainous. As both kindly Mary and cutthroat Walker, Eve takes great advantage of her natural prickliness to portray characters whose motives are intriguingly opaque. Throwing Mary Walker into the mix breaks up the show’s structure and gives the season an extra element to contend with beyond just building up to a big showdown with Davos. Even with all those improvements, Iron Fist is still by no means a perfect show. The dialogue, in particular, can still be really blunt and clunky; this show wouldn’t know subtext if it punched it in the face with a glowing fist. There are some missteps unique to this season as well. In general, it doesn’t quite know what to do with the Meachum siblings, nor does it ever really want to address the fact that Joy (Jessica Stroup) is now an entirely different character than she was in the first season. Tom Pelphrey is still a standout as Ward, but the character feels really unmoored in the second season. The choice to cut back on the boring boardroom maneuvering of the first season is a good one, but the show winds up going too far in the other direction. 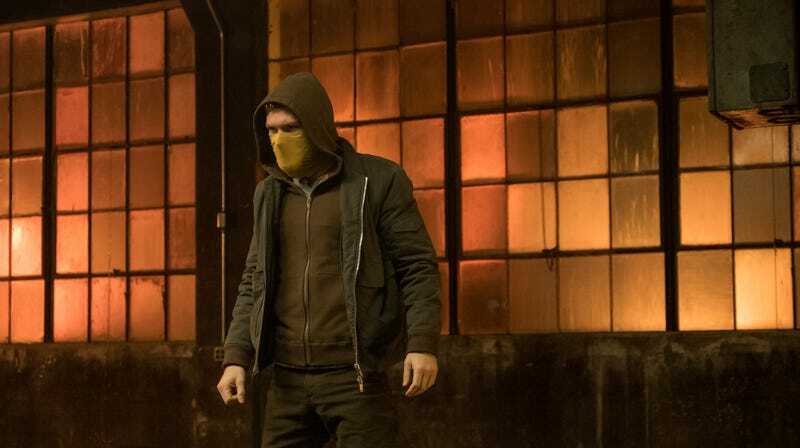 Abandoning the corporate world gives Ward little to do and means the show winds up ignoring a big component of what makes Danny Rand unique as a character (at least within the Defenders universe). That Danny wants to try living a simpler life and working for a living makes sense for him as a character, but it’s also bizarre that Colleen regularly bemoans the lack of funding for her community center without ever bringing up the idea that her billionaire boyfriend—a man deeply committed to helping Chinatown—might want to make a donation. The biggest loss from season one to season two, however, is how the show handles comedy. For all of its many, many flaws, Iron Fist’s first season could be remarkably funny when it wanted to be—particularly when it was mining Danny’s return to New York for fish-out-of-water hijinks or whenever David Wenham did pretty much anything. With Danny more firmly adjusted to modern life, season two is much more dour than the first, with only the occasional deadpan line from Davos or Ward to mix things up. The second season is more cohesive, but also more tonally static. The first season had a certain “so bad it’s good” quality that I occasionally found myself missing.